Let's say you have a dream (and I'm not talking about an ohh I want to own Disney World when I grow up dream--an actual dream that takes place during the REM cycle). And let's say that dream involves being in a comic book shop on a Wednesday. (With me so far?) Then let's say that, in the dream, the comic shop that your dream self is inhabiting has run out of a certain book. In the case of this particular dream, let's say that certain book is Flash: Rebirth, issue 2. Now, let's say you wake up from this dream. Normal people would likely go, huh, that was odd, right? Sure they would. Well, let me tell you, I am not normal. No sir. Me? I woke up from this very dream, last night, and instead of falling right back asleep and not thinking much about it (as a normal person would have done, mind you), I woke up and was angry at the (fake) comic shop that I had dreamed about. If you have a dream wherein you go to a comic shop and that shop is out of a certain book and you wake up from that dream being angry at the fake comic shop...you might be a big, fat dork. First up is a book from DC Comics (oh man, can you feel the DC love on this blog lately?) entitled Dead Romeo. I bought issue one on a lark last month, mostly because of the great art by Ryan Benjamin. Then I read the book, and I remember thinking, huh, this writer's pretty good. I checked the credits on the book, and found that his name is Jesse Blaze Snider. I made a mental note to check if he had written anything else, and then moved on to the next book on my pile. For a myriad of reasons, I never did get around to checking out this Snider guy, but then someone at my LCS mentioned the book. Being a big, fat windbag (in addition to being a big, fat dork), I immediately chimed in and said how much I liked the first issue. And then someone else said, "yeah it's pretty cool--the writer is Dee Snider's son." Dee Snider, of course, is/was the lead singer of the 80s metal band, Twisted Sister. I thought that was pretty interesting, and I really admired how neither DC nor the writer seemed to push this issue while promoting the book. Heck, I had read/heard almost nothing about the title previous to its showing up on the racks at the store last month. Jonathan Romero, aka "Dead Romeo," was the lead singer of the '80s rock band "The Dead Romeos." But that was before a mysterious set of circumstances turned him into a vampire and sent him straight to Hell. Now he's back on Earth and he has a difficult choice to make: Kill his true love and earn his permanent release from eternal damnation – or protect her and burn for eternity. Either way, someone is going to die! It's vampires, romance, rock and dismemberment like you've never seen before! New writer Jesse Blaze Snider joins artist Ryan Benjamin for a bloodsucking good time in this all-new 6-issue miniseries. 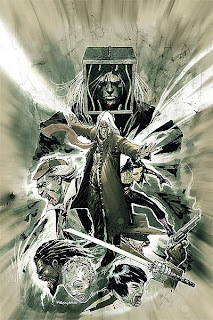 The interior art is just as stellar as that awesome cover, and the story itself is fast-paced and dark, and it introduces a pretty cool twist on vampire legends. Romeo sets out to prove that the road to Hell is literally paved with good intentions as he makes a choice to spare a life. But it's a choice that almost surely spells eternal damnation for our hero. Also in this issue, vampires rampage in the city streets as we find out in gruesome detail that the local police are no match for the undead. For fans of vampires and/or rock culture, check this title out--I think you'll dig it. 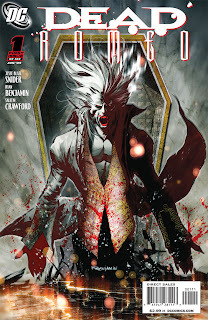 Next up, we have Killer of Demons, issue 3 (of 3), from Image Comics. I wish I had mentioned this title last month, since it seems like it's starting to get some attention in the comics press, and because this is the last issue of a three issue mini-series. Now, despite the foreboding-sounding title, this is a very funny book. I wouldn't call it lighthearted, per se, just because there's a good amount of violence in each issue, but I did find myself chucking throughout each of the first two issues. The story is by Christopher Yost, who will be familiar to Marvel fans as the co-writer of the great X-Force series, with fantastic art by Scott Wegener. 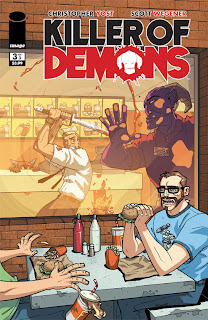 Hell has invaded Earth, and only one man can stop it...junior account executive Dave Sloan, aka the Killer of Demons! With an angel at his side, Dave can see the demons that have infiltrated our world...and they all have to die! But these 'demons' are mostly Dave's co-workers at the office or people that annoy Dave in some way, leading him to believe that he's gone totally insane. Or has he? Now Dave must fight to survive and find out the truth...is he a whacked out mass murderer, or the last hope the world has against the forces of Hell? The fiendish finale! But what's at stake? Dave Sloan's mind and soul? Or the fate of humanity? Is Dave fighting his way through a horde of demons, or is he blazing a trail of death through his co-workers and cementing his place as a mass murderer? Who is telling the truth...the angel, or the devil? But as Dave faces off with Astaroth, Archduke of Hell (or possibly his creative director), one thing is for sure...demons are going be be killed, whether they're real or imaginary. Again, this is the final issue of a three issue mini, so if your shop has the whole series, check it out. If not, definitely consider picking the whole thing up in trade when it comes out! Next, we have a book that's been getting tons of press lately, and for good reason. From BOOM! Studios (yes, that's how they spell it) comes issue two of Mark Waid's superhero-trope destroying Irredeemable. 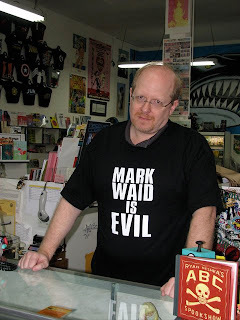 The basic premise of this book is summed up by Waid in the recent (and fantastic) interview he did over at Ain't It Cool News (thanks for the heads-up on that, Scott!) where he states, "The high concept of IRREDEEMABLE is that it's the story of how the world's greatest superhero becomes the world's greatest supervillain. It doesn't happen overnight, so what are the milestones? What's the dark road?" Heroes are being picked off one-by-one in a brutal and viscous assault. They never stood a chance – never saw it coming. A small cadre of heroes race against time and space to stay alive and turn the tables. A "twilight of the superheroes"-style story that examines super-villains from the writer of KINGDOM COME and EMPIRE! Now, be warned--this is one of them "hot" books, so finding issue one might be tricky, but this series is worth the extra effort. So, c'mon, bend to the hype and buy it already! Anyway, that's it for this week. What are you Waiting for?